2077 Ste-Catherine W, 514-937-0156. On Ste-Catherine, just west of Rue du Fort. This Turkish restaurant has a unique window display of the cooks making lavash - basically huge chappatis/tortillas. The appetizers - Mezze platters - are good enough for a meal, many choices to pick from, and come with a freshly made lavash bread. The appetizers include Baba Ghannouj - charbroiled eggplant puree with pomegranate paste and roasted vegetables, Hummus - chickpeas puree with tahini, lemon, garlic, olive oil, Muhammara d'Alep - pomegranate paste with mixture of walnuts, pine nuts, pepper. The borek - Turkish feuillette - is excellent. These are flaky phyllo dough pastries filled with feta and spinach or beef and potatoes along with a splash of hot spice - really good. The spinach and feta borek is a great accompaniment to main dishes like Manti, or to a sampling of the mezzes. 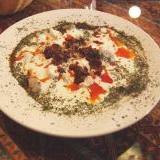 With a main dish, you can request an half-order of borek so you have chance of finishing it all. 2015 update: They heard me! Now the borek is half-size - a single large square instead of two, so it is now the perfect accompaniment to Manti. 2015 Manti and Borek picture. Manti is listed in the specials section - small meat filled dumplings in a thin yogurt sauce with mint, and melted pepper butter paste on the top. Looks nice, and tastes great. It does take 20-30 minutes to prepare this but the wait is all worth it. 2015 update: Looks like they redid the whole menu, and also tweaked the recipes a bit. They are better prepared to make Manti and now takes just 10 minutes or so. And it is no longer a mix of hot dumplings and cold yogurt - the yogurt now seems to be room temperature. Still the best Manti around. Even NYC does not have this good a version. Gozleme - two lavash breads with feta and spinach sounded good - but this was a bit too dry and lean - not enough feta or spinach in it. This would work well when taken along with the appetizers. The borek is much better in that it is more balanced in having sufficient quantity of fillings and is not dry like the gozleme. The main dishes are listed as Sach Kavurma - sauted meat with vegetables, and Tava Kavurma - sauted meat with onions and eggs. These are served with pilau - bulghur wheat. And to top this all, they also serve sandwiches, and have items for breakfast also.